BETTER TOGETHER SHOWING STRONG IN RENFREWSHIRE AS THE SNP RUN OUT OF STEAM. The Labour Battle Bus for Better Together was very successful in Renfrewshire on Saturday. Crowds gathered to see what was being done and the usual leaflets, balloons and badges were very popular with the shoppers, many of whom stopped to have a blether and the feedback was most encouraging. Another part of the No campaign over the weekend in Renfrewsire was door to door canvassing, this is by far the best way to judge what people are thinking and how they will vote. When our returns were gathered in and counted we were delighted to see the following results. --- NO, 55% - YES 15%, - DONT KNOW 30%----. It’s looking solid for the No Campaign but there will no no complacency, we will continue to work to improve even more on these great poll results. The fat lady hasn’t yet sung but it looks like she is clearing her throat to announce a resounding win for the Union. PHANTOM VENTRILOQUIST OF OLD RENFREWSHIRE COUNCIL IS EXPOSED. During the meeting of the council which I covered in my last article I found myself wondering if the snp or any other member of the opposition was in fact a ventriloquist, and a damn good one at that. You see for some time now I have been hearing interruptions from what seems like a female voice from across the chamber when Labour members are speaking. I was beginning to wonder if I was hearing things but my colleagues said they heard the interruptions as well but they unlike me never bothered with them, I however being an inquisitive type became quite determined to find out what was going on. I watched diligently to see if any of them were moving their lips ever so slightly when the mysterious voice sounded, alas to no avail. I then concentrated my efforts on watching to see if anyone was covering their mouth with their hand when the now very spooky voice was speaking , but that was unsuccessful as well. I even took to watching to see if any of them was drinking water as the voice spoke, a trick which only very accomplished ventriloquists can master but still no joy. During the snp’s rabble and the serial attention seeker’s loss of control the voice was incessant. I resolved to go back to sleep and forget about it but it was not possible until it suddenly struck me, the voice had ceased and I was looking at the culprit or to be more accurate not looking at the culprit because I was staring at an empty chair, the empty chair and the missing voice were no coincidence. I waited and sure enough the occupant of the empty chair came back and right on cue so did the voice as snp Councillor Mags MacLaren who would not say boo to a goose demurely lowered her head over her papers and started heckling, a rum do right enough eh?. I’m not absolutely sure what all this means and I’m not so sure I want to go there either but there you have it, an snp heckler who does not want to be seen, perhaps she’s shy, perhaps she is shouting out lies and doesn’t want to be challenged, perhaps she is shouting nasty comments ‘a la’ Cybernat style, as i said I don’t want to go there but I’m glad I’ve solved the mystery, even if it has left me feeling a bit uneasy, still, each to his/her own eh?, at least she has provided a laugh not something you often get from the snp, it wouldn’t do if we were all the same would it?. RENFREWSHIRE COUNCIL MEETING AND ONCE AGAIN THE THE LUNATICS TAKE OVER THE ASYLUM. Thursday June 26 20 14 - 09.30am and the palace of varieties AKA Renfrewshire Council on the banks of the ancient River cart opens for a full council meeting. The behaviour, body language and dejected look of the snp councillors seemed to be driven by the certain knowledge that they are heading for defeat and humiliation at the laugharendum. Their barely concealed fear and resentment also spooked the council’s resident serial attention seeker (guess who) who went in to a frenzy which reminded this writer of Luis Suarez after being fouled by an opponent. Raving, ranting and over acting like a madman he treated us to an abysmal display of synthetic rage, laced with the usual ‘big words’ to impress us, the pip squeak voice and the smatterings of Greek, Dog Latin and pigeon English, we got the lot, he will be appearing at the ‘end of the pier show’ shortly . The kind of performance that was better described by someone else as “ a tale told by an idiot, full of sound and fury, signifying nothing, ‘the Scottish play’ by William thingmy. The opposition rabble came armed with motions on such original issues as nuclear arms and the House of Lords, I tried to count the number of times we have heard this stuff but the task was too much for me. This laugharendum has been going on for approximately 3 years and the repetitive and patently disingenuous ravings about these two subjects have been getting raised since it started. We now have a situation where the snp have not managed to record one single lead in any poll for that 3 year period; in fact a recent poll showed that a majority of Scots are content to have the nukes. on the Clyde, reflecting what we have all surely known for some time which is that the snp’s commitment to removing the weapons from Faslane is based on gathering votes and nothing else. Even the patently ridiculous claims they have made about occupying the high moral ground were rendered bogus when they decided they wanted to be members of the organisation which they have openly reviled for years, NATO, which is of course a nuclear weapons organisation, Janus faced opportunists is all they are. Their exhausted and puerile tirades against the House of Lords do not stand up to close examination either when we consider that the last time the snp debated the subject of The House of Lords at their conference the abolitionists won the vote by a whisker and the most prominent snp member in favour of the snp having an ‘influence’ in that place was rather predictably the head of the snp’s own Royal Family. Queen Winnie Ewing, I reckon that her Royal Highness Queen Winnie believes in the right of Kings and Queens to rule and that includes her. The snp of course believes that the Queen should be the head of state in a separate Scotland but, no one seems to remember voting for her so, the snp’s increasingly bizarre position is that the Lords must go because they are unelected but the monarchy are OK despite not being elected?, have I got that right?. It’s a pity that the CCC TV cameras are not yet installed, it would have been illuminating for the public to see the opposition rabble in action, particularly the ‘attention seeker in chief’ as he babbled away with his foam flecked screeching, like a rabid dog which had spent too much time “out in the mid day sun”, still maybe we will see that in the future, we might even be able to sell tickets. FOR THE BEDRAGLED SNP/SEPARATIST/CYBERNATS, IT’S WOE, TWICE WOE AND EVEN THRICE WOE, IF THIS WAS A BOXING MATCH THE REF WOULD STOP THE FIGHT. Just when alex salmond and the “tartanshirts” think things can’t really get any worse, I have the delightful task of publishing the table below which is obviously self explanatory. There is another thing which these results highlight. The locations are up in the Highlands which is the area that usually gets shaded yellow on election night, it’s wee Eck’s home turf, the kind of area where he actually swaggers even more than he does at Holyrood. Up here he has taken to imitating the famous swinging gait once perfected by John (Duke) Wayne after he slaughters a couple of hundred Indians or savages as we used to call them when we roundly booed them at Saturday matinees, way back before we learned sense. These youngsters obviously have good sense in abundance. Taking a leaf out of the snp/separatist/cybernat manual called “nobody likes us we don’t care” I would also like to report on another set of polls from the Scottish borders where the No Campaign has approximately 65% of the vote and the yesmen are limping along at 35%, carrying their forks in case it starts to rain soup. Enjoy. 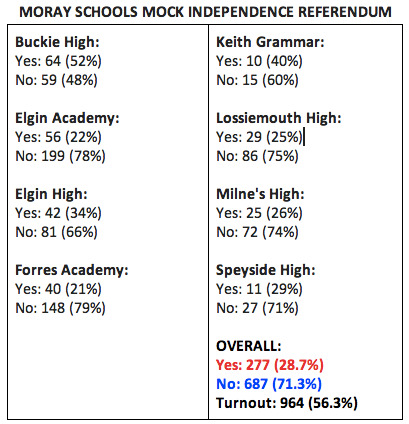 Here is how pupils eligible to vote in the referendum in Moray voted. WANT THE TRUTH? ASK THE UNIONS. Here is truthful piece of information regarding welfare and benefits from the TUC provided by my Labour Party comrade Robert Moore. It is easy to understand and it exposes the lies of the Libdem/Tory cabal in government. So easy to understand is it that people could be forgiven for asking why the right wing press are not aware of it or as is more likely they do know about it but do not publish it. Why is that I hear you ask, mendacity that's why . There is however a very serious welfare benefits abuse going on and it's far worse than this, it is the scandal of the billions of pounds in welfare and benefits that are not being claimed by people who are entitled to claim them. The elderly, the infirm, the long term sick, those who are entitled to benefits and don't know how to claim them. People who have worked all their lives and paid their taxes and national insurance, these people don't have much and certainly don't have anything stashed in tax havens. 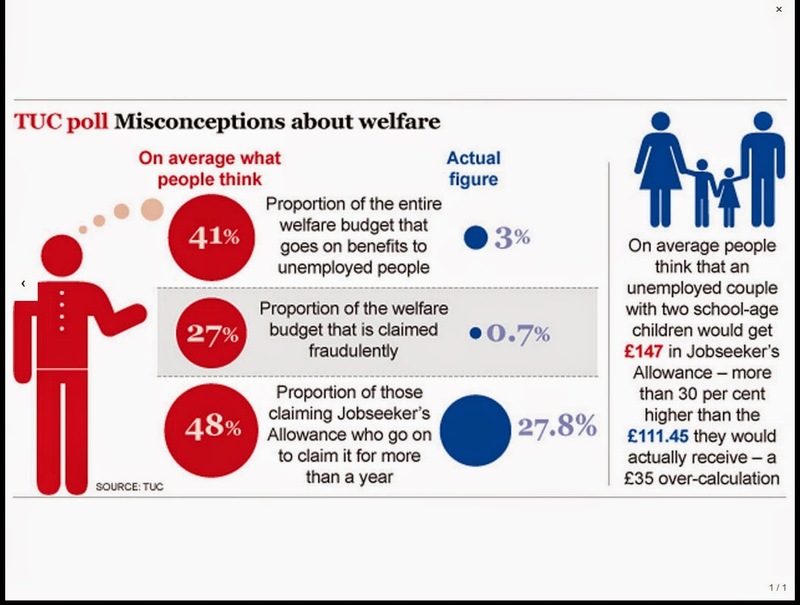 The government spend millions on so called benefit fraud and nothing to help those who are not familiar with the system and that tells us all we need to know about the society we live in, here are the facts. The Political Giant, The Tough Clever Teacher, The Urbane and Determined Politician and Nicola Sturgeon. To The old Glasgow fruit market for the Labour ‘No’ campaign meeting. Over 600 people crammed in to the hall with standing room only all the way up in to the balconies. There is no doubt that many of those present were there to show their solidarity and their love and respect for Gordon Brown, a man who, despite what the right wing press and their allies in the snp say remains hugely popular with the Scottish people, his ain folk. This popularity stems from the people’s innate ability to recognise someone who is not only a brilliant man but also a down to earth honest politician, the affection for him was palpable, they were welcoming and saying thanks to one of their own. Their message was defiant and could not have been clearer, they knew and wanted him to know that he had been unfairly treated by the establishment and they knew why as well. His brutal treatment was down to one main thing, fear, the establishment feared him, they feared him because of his intellect his energy and his dedication to the cause of socialism, no PM has ever received such constant abuse and they also knew he could not be bought. Anyone who can’t be bought frightens the Capitalists and Tories, all of whom have a price. Sharing the platform was Johann Lamont who has made her critics eat their words by refusing to buckle under the pressure and abuse she has been subjected to, she was previously a secondary school teacher in Glasgow, what else would you expect?. She is quite fearless and like Brown she is direct, honest and devoted to the cause, both made combative and intelligent speeches and were cheered to the echo. The atmosphere was electric and the meeting was inspirational, a great riposte to those who keep trying to tell us that the labour Party is finished, no other Scottish party could have done this, it was the party at its best, belligerent, cantankerous and ready for the fray, as mark Twain might have put it ‘reports of my death are greatly exaggerated’. Another topical event worth noting was the TV debate between Douglas Alexander and Nicola Sturgeon. A distinctive pattern has emerged over the past 18 months or so when Ms. Sturgeon is debating and that is her preset intention to turn any debate in to a ‘stair heid rammy’ this sordid little con allows her to claim that she did not lose, but very little light gets shone on the subject in question. This one however was different, how they managed to get her to behave with some decorum I do not know but they did. Her decision to behave herself however in my opinion might well be the last time we see that side of her this side of the referendum. You see, this time she was quite lost without her loud hailer and broadsword and it turned in to a bit of a car crash for her as Mr. Alexander courteously and forensically dismantled her arguments and her credibility. I don’t think we will see her repeat this experiment again so we can look for the return of the ranting fishwife when next we see her on our screens, unless of course the snp put her on gardening leave before she does any more harm.